Pompey put National League Maidenhead United to the sword as they sealed their FA Cup progress. Ben Thompson scored his first Blues goal. Oli Hawkins, Jamal Lowe and substitute David Wheeler were also on the scoresheet in the 4-0 victory, with Kenny Jackett's troops showing a clinical edge. Given it was against non-league opposition, but of the 11 League One wins Pompey have recorded this season - only three of those have been by more than a one-goal margin. 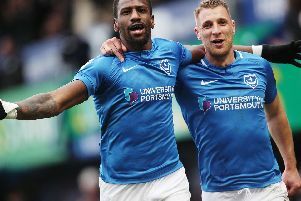 The hope will be Pompey can now transfer the clinical side shown against the Magpies to the League One promotion push. Ben Thompson is up and running at Pompey. The Millwall loanee bagged his first Blues goal in appearance number 16 for the club against Maidenhead United in the FA Cup. Since arriving from The Den, Thompson has been growing with every appearance. Former Lions manager, Kenny Jackett, has deployed the 23-year-old as a number 10 and in a deeper midfield role during his time at Fratton Park. The one thing Thompson didn't have heading to Magpies in the FA Cup was a Blues goal. Now he's broken that duck, the hope will be more will follow as Pompey continue their push for the Championship. Kenny Jackett has been settled on his team in League One for the majority of the current campaign. Table-toppers Pompey have been quite fortunate in terms of injury and suspension. But both Tom Naylor and Nathan Thompson have missed out after picking up five bookings in recent weeks. However, the Blues have plenty of quality waiting in the wings if and when Jackett needs it in the coming months. Substitute David Wheeler got his second Pompey goal following his introduction at Magpies. While frontman Oli Hawkins has been preferred to Brett Pitman for most of this season, who scored 24 goals in all competitions last season. Add to that experienced centre-back Christian Burgess, currently second choice to centre-back pairing Jack Whatmough and Matt Clarke, plus academy graduate Ben Close - and Pompey have plenty to call upon should they need it.